Bicycle ambulances provide much-needed emergency transport for children who are sick with malaria and couldn't otherwise reach health facilities. Toby Madden/Transaid. Thousands of infants and children in rural Zambia suffer or die unnecessarily from malaria each year because they lack access to high-quality medicines and proper medical care. But a recent pilot program shows how trained local volunteers administering crucial medicine can keep a child well enough to be transported to a health care facility for further, potentially lifesaving treatment. With technical and financial support from the Switzerland-based Medicines for Malaria Venture, the program—named MAMaZ Against Malaria or MAM—was built on two earlier projects: Mobilising Access to Maternal Health Services in Zambia (MAMaZ), funded by the U.K. Department for International Development; and MORE MAMaZ, funded by Comic Relief. MAM introduced the medicine rectal artesunate (RAS) into severe malaria case management and trained community health volunteers in 45 rural locales in Serenje District, Central Province. During peak malaria season, the team identified 1,215 cases of children with severe malaria. MAM produced encouraging results. In its intervention area from November 2017 to March 2018 (peak malaria season), the team identified 1,215 cases of children ages 5 and under with severe malaria danger signs, with three children dying; this compares with only 224 cases identified during the baseline period one year before, when 18 children died. This indicates the work increased the intervention communities’ ability to identify danger signs, provide pre-referral treatment to children with RAS, and refer them to health facilities without delay. When confronted with patients with severe malaria, the trained volunteers administered RAS 100% of the time, sent patients to the nearest health facility, and achieved strong compliance on following up with patients when they returned home. At the same time, residents increased their recognition of key symptoms of severe malaria, such as “not being able to eat or drink,” from 29% to 86%, leading to improved case management and care. The MAM results were presented in an evidence brief July 27 at the National Malaria Elimination Centre (NMEC) in Lusaka. Attendees included officials from the Serenje District Health Management Team, Central Province Health Department, USAID/President’s Malaria Initiative, the Global Fund, PATH, and MMV. The results are expected to inform the Zambian government’s planning and funding of programs to meet their ambitious goals for malaria elimination. Implemented by Transaid, local partners Development Data and Disacare, and DAI—a consortium selected through a rigorous review process—and in close collaboration with NMEC, MAM addressed the factors affecting communities’ access to child health services; this work included building on the work of MAMaZ and MORE MAMaZ to increase access to emergency obstetric and neonatal care. DAI led the pilot’s process to engage communities, including designing approaches specific to each community, ensuring alignment with national strategies and systems as well as international good practice for management of severe malaria, and supporting monitoring and evaluation of the work. Our approach aims to build wide social approval for improved behaviors and assist communities to develop and lead their own emergency response systems. MAM launched in June 2017 in partnership with NMEC and the Serenje District Health Management Team. Quality-approved RAS 100-milligram suppositories were procured for use in the 45 communities, with NMEC ensuring that Serenje District had an uninterrupted supply of severe malaria drugs and basic medical supplies. A whole-community approach improves how individuals recognize stricken children, report the illness, and seek treatment. The MAM team trained health care providers at the district’s eight intervention health facilities in severe malaria case management and trained the local community health volunteers around a severe malaria and broader child-health agenda. A community monitoring system maintained by the volunteers generated data on children with suspected severe malaria and other common illnesses. These communities further rose to the occasion by providing safety nets for families with sick children, including savings schemes and food banks. The program also provided emergency transport in the form of bicycle ambulances to communities without the means to reach health facilities; the bicycles addressed the growing demand for referring patients to health care facilities. Close partnering with the District Health Management Team and NMEC ensured that key activities were led and supported by the Zambian government, helping pave the way for scaled-up services. Motivated and well-trained community health volunteers in rural locales are effective at identifying and managing severe malaria cases. These trained volunteers increased the reach of project activities but also created for themselves a support group that improved motivation and sustainability. A “whole community” approach that reaches out to all community members is required to improve how individuals recognize stricken children, report the illness, and seek treatment for them; this outcome cannot be achieved in locales where there are only one or two trained volunteers per community. 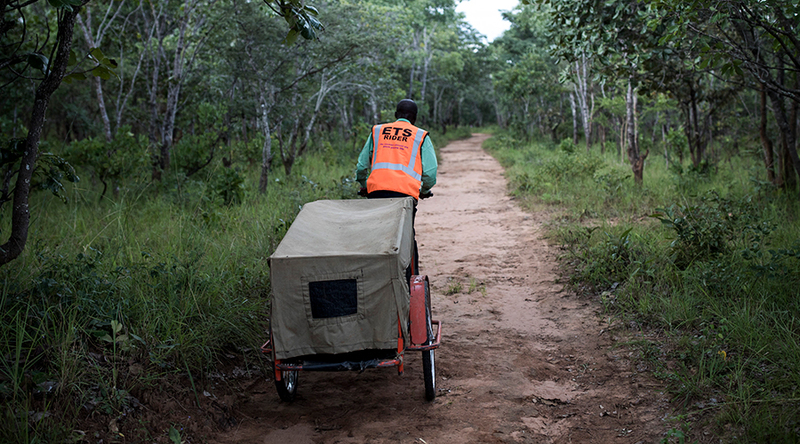 For the project’s hard-to-reach sites, the average distance to a health facility was nearly 14 kilometers; community-managed emergency transport systems such as bicycle ambulances can significantly reduce travel times to health facilities and encourage prompt referral of very sick children. Increasing demand for severe malaria services must be met with a reliable supply of drugs and medical consumables as well as health facilities that are accessible around the clock and capable of managing severe malaria cases. Zambia’s NMEC wants to roll out the use of RAS across the country. Should it do so, the government should consider adopting the MAM approach by training significant numbers of community health volunteers in the case management of severe malaria. These local volunteer forces would build on existing health system structures, promote fair access to severe malaria services, and be cost effective. MAM’s evidence-based training approach could be adapted for national community health volunteer training manuals, including those for integrated community case management of malaria volunteers and for Zambia’s Safe Motherhood Action Groups. As quality-assured RAS is distributed broadly, it will be important to ensure an uninterrupted supply of injectable artesunate and malaria commodities (such as rapid diagnostic tests and disposal gloves) at rural health facilities. In addition, community-managed bicycle ambulances have been shown to ensure patients get to health care facilities to receive appropriate and sometimes lifesaving care. Ideally, these bicycle transport systems can be successfully budgeted for, managed, and maintained locally. An estimated 70% of the world’s burden of severe and fatal malaria falls on young children. Severe malaria can be recognized in children at the community level by observing danger signs—fever, inability to eat or drink, repeated vomiting, convulsions, unusual sleepiness, or unconsciousness. In practice, however, many cases are missed and children suffer and die as a result. Many barriers and delays at household and community levels hinder the prompt uptake of malaria services. We are confident that the work of MAMaZ and MAM, combined with the Government of Zambia’s commitment to thwarting malaria, will lead to thousands fewer children suffering unnecessarily from this disease. This post originally appeared in DAI Developments.